What Is It?... AND... How Do You Brew It? Feel like indulging in something exotic? Vietnamese coffee may be just the ticket! The purchase of a simple Vietnamese style coffee maker could become a new adventure in your tour of the Coffees of the World. 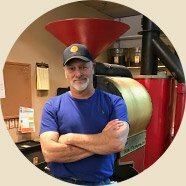 Many consider it to be one of the most enjoyable and fulfilling methods of brewing coffee. This type of coffee is usually brewed one cup at a time and yields a very strong concoction that can also be used for all kinds of fun recipes. The traditional recipe calls for condensed milk and returns a powerful, sweet brew that is memorable and perhaps even a bit habit forming. This coffee maker is kind of a miniature drip brewer. Although you can play with different grind settings, it's really designed for a fine grind. Used thusly, it delivers a slow- dripping, intense brew that carries the full compliment of flavorful coffee oils. Yum, Yum! It is rather like espresso if consumed straight up. You probably have enough cash in your pocket right now to buy this brewer. In fact, if ordered online you may pay more for the shipping than the brewer! A great alternative is to do a Google or Yahoo Local search for an Oriental market. I know from experience that browsing an Oriental Market can be an adventure in itself. So, if you don't mind the minor learning curve and would like to try a coffee experience that can be both fully engaging and enormously rewarding, give this a go! 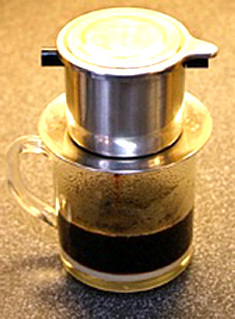 For an excellent step by step tutorial on how to brew Vietnamese Style Coffee, please click on the "I Need Coffee" icon below. then you might want to browse the rest of this website!